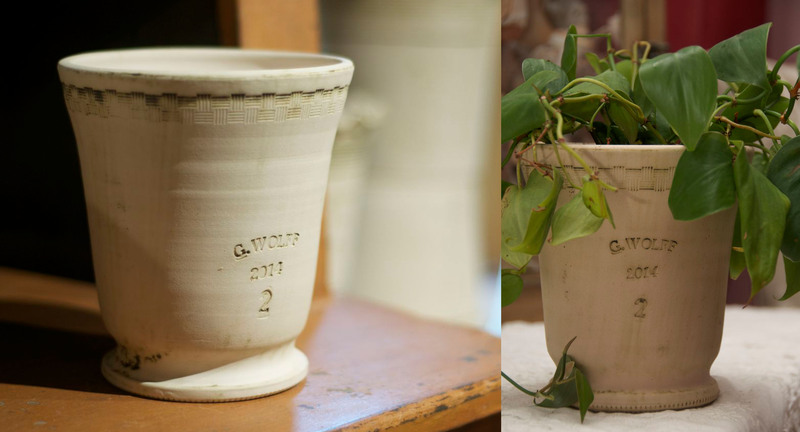 For almost a year, my dear friend Eric has been telling me about these amazing handmade pots he has for his plants. He had read about Guy Wolff’s work in Martha Stewart Living and went up in November last year to check out his studio. So on Saturday we took our own little field trip up to Woodville, Connecticut located on 202, a beautiful rural, scenic highway. Guy’s studio and shop is in a beautiful red barn and you are greeted with beautiful pots outside. 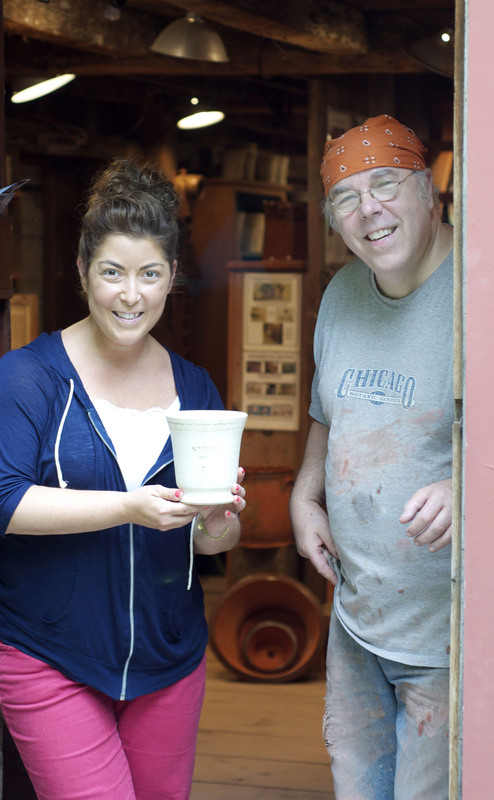 Guy himself greeted us at the door and started chatting with us right away with stories and explains his approach to making his pots. From early on in life, Guy was surrounded by creativity and art, his own father, Robert Jay Wolff, was an abstract expressionist painter. His uncle was the modernist architect Marcel Bauer. 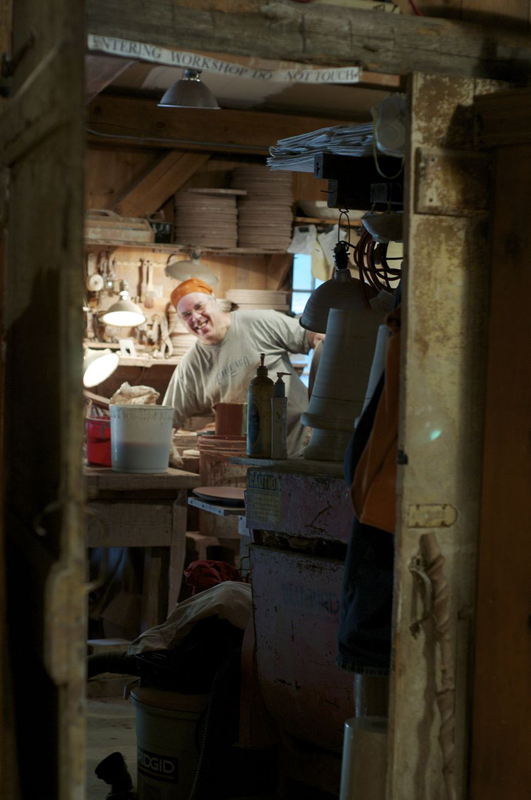 He began his pottery studies up in a small art school in New Hampshire, a discipline he never thought he would get into. Since opening his own pottery shop in 1971, his own work has been featured at the Met Museum, celebrating the anniversary of the Cloisters in New York City and the Isabelle Stewart Gardner Museum in Boston. There are many different markings and designs on plates that denote their historical significance. Guy is influenced a lot by history, whether it’s an 18th century English pot or a centuries old Asian vase; he finds his inspiration in their design and function. Here he is showing Eric how some of those markings are made. He couldn’t really chat with us in his shop, he was actually working that day, so invited us into his studio to watch as he was working on some plates for a customer in town. Here Guy is adding a darker colored glaze to the plate to complete his design before it gets fired in the kiln. 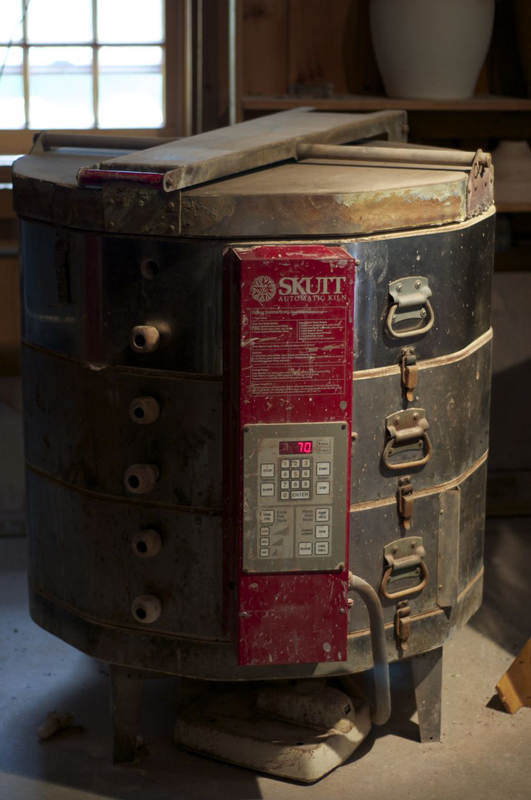 This is one of 3 kilns that Guy has in his studio to fire his work. Guy has a very distinct way of signing his own work. The stamp (or coggle) G. Wolff, the year and a number means the pot was made by his own hands on his own wheel. There is also a signature on the bottom of the pot. The number on the pot is the weight. Not only is Guy a Master Potter, but he also loves music. He is an accomplished banjo player and has a love for traditional Appalachian Music. You can read more about his love for music here. 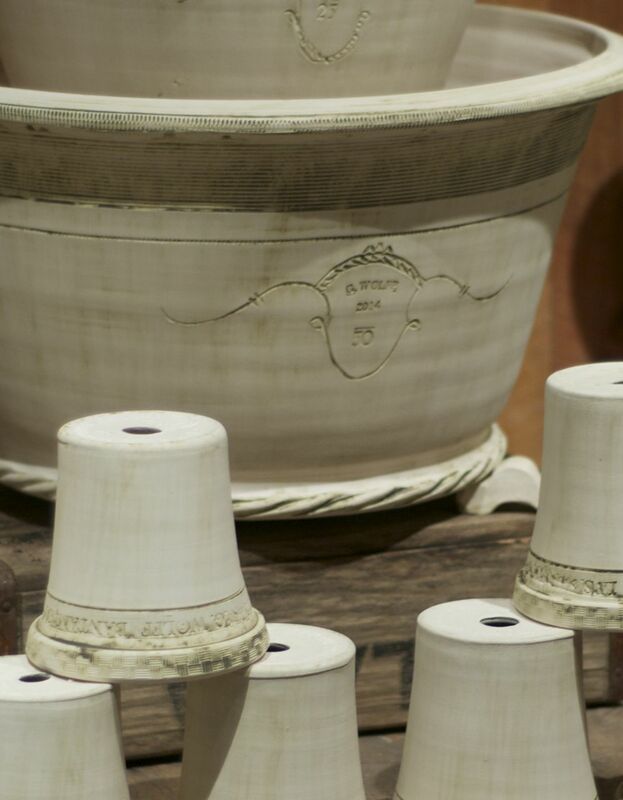 Each pot has it’s own personality and is handmade individually. So while they look all the same, when you get close up, you start to see their differences. This is the pot I chose for my plant at home. I love the shape and the stamping at the top. It really was a treat to chat with Guy and watch him work. He is very generous with his time, stories and art. If you ever find yourself on 202 in Connecticut, take the drive to see this body of work in person. Guy Wolff is truly a master of his craft and it’s worth the detour to experience this bit of Americana. For more information on Guy Wolff and his work, please visit his website. ← What do you do with your cake scraps?? ?